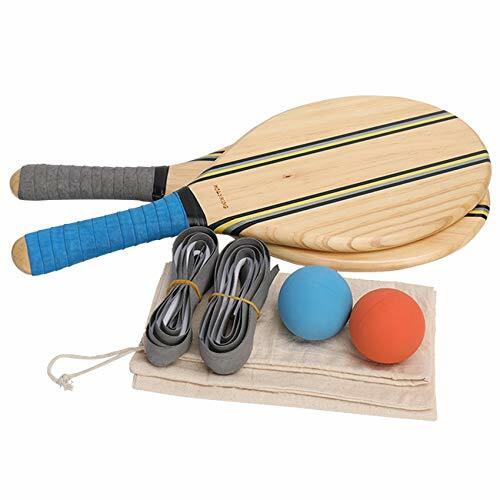 This Holyking paddle set comes with 2 natural wood paddles, 2 balls and a bag. The paddles are made of pine wood. The handle of each paddle is wrapped with a sweat band.The Paddles have a blue original band and two grey spare bands. Each paddles weights between about 10-12 ounces according to trees of different ages, so they are light enough to play all day. The paddles have a nice water and sand resistant finish on them. Some people call these beach bats or paddle ball or even beach pickle ball. Unlike pickleball, Holyking is a beach paddle sport where you work with your partner to hit the ball back and forth as many times as you can without allowing the ball to hit the ground. Some other names for this type of beach paddle game around the World are Matkot, Beach Tennis, Smash Ball and Raccettoni. Grab a friend and start playing the fast paced game of Holyking now.